Don’t forget about the ‘flagship’ services introduced in 2006 with the Regional Fast Rail project – they ran express between North Geelong and North Melbourne in 45 minutes, over track shared with suburban trains. These times were rather unrealistic – over the next decade they were progressively padded out, before being eliminated when Regional Rail Link opened. In 1954 you could take a train from Flinders St. to Frankston in 43 minutes at the equally not-very-convenient time of 9:10am. It only stopped at Caulfield if required(! ), Frankston, then all stations on to Stony Point. Today the fastest trains from Flinders St. to Frankston take 57 minutes. Typo: For instance, inbound V/Line trains are given ten minutes between Footscray and *North Melbourne* — amazingly, this is two minutes more than most Metro trains, which make an additional stop at North Melbourne. Sad! perhaps an unintended consequence of performance targets is the train operators padding out times so the trains always run on time and they don’t get penalised financially for late running. Google maps states the distance between Geelong and Melbourne is 74.9km. If the train can travel at 110km/hr, the journey should take less than 50 minutes. The new timetable adds two minutes to the trip from Sunshine to Geelong – they leave a minute earlier and arrive a minute later! Trains with a usual express stopping pattern, though, can get from Geelong to Sunshine in just over 40 minutes, and to Southern Cross in closer to 55 minutes – e.g. the 5.08pm can get to Southern Cross around 6.04pm. The big problem with punctuality on the Geelong line is the single track past Geelong – e.g. my train this morning (arrived Geelong just after 9am) was going to sit at Geelong for about 10 minutes to wait for a train coming from South Geelong or Waurn Ponds before it could continue. You can’t really complain about frequency on the Geelong line, with trains every 20 minutes – that’s just as good (or bad) as some suburban services. So, all things considered, I’m sure the service overall is better than 100 years ago. @Nick, thanks for catching the typo – fixed! Of course, a train from Melbourne to Frankston non-stop bypasses almost all of the stations that people actually use — Frankston is very busy, but add together almost any other 2-3 stations south of Caulfield and the patronage exceeds Frankston’s. I did enjoy having a look at the 1954 timetable on the way home! Definitely much quicker now to get from Southern Cross to Little River (39 mins now, 54-62 mins in 1954) and Lara (43-45 mins now, 62-71 mins in 1954). And all the scheduled times between stations from Little River to Geelong are a minute or two quicker now, cutting up to 10 minutes off a normal service. By the way, outbound trains from Southern Cross have 7 mins to get to Footscray and 5-6 to get to Sunshine – inbound they can do that too, regardless of what the timetable says. Last comment – the Geelong line probably serves four purposes now – whether it does them all well is another question! Apart from the core link between Geelong and Melbourne CBD (was that one outbound express per day? ), it also serves as the commuter service between the growth outer western suburbs and Melbourne CBD (more trains and electrification needed in future), it links these suburbs with Geelong, opening up Geelong to a much larger employment market, and there’s the scope for Geelong metro along the spine from Waurn Ponds to Lara (needing that single track duplicated). Yep. Vline out of SXS is an utter mess. Couldn’t book my ticket online. “Just turn up on the morning” I’m told, I do that then wait 20 mins in queue and nearly miss the train. My paper ticket gives neither the departure platform nor time. There is nobody checking paper tickets, Geelong train nowhere to be found. Spend five minutes running round like a headless chook. Eventually some 15 year old arrives at the barrier. “Which platform?” She stares at my ticket, spends a solid minute looking this up in a scrappy black book and eventually I want something like platform 32DD. Tries to tell me I have a huge wait in Geelong before getting on a coach to Apollo Bay. I happen to know that bus is an extension of the train and it is of course ready and waiting on arrival in Geelong. We depart ten minutes late anyway. All I’m left thinking is “God I hope tourists don’t use vline”. All V/Line timetables allow a few extra minutes between the last two stations to make up for any late running. Have a look at the Bendigo timetable and you’ll see that trains to Epsom/Eaglehawk are allowed 5 minutes between Kangaroo Flat and Bendigo, but the trains that terminate at Bendigo get up to 15 minutes for the same section. I remember being on one of those services one day and the conductor was apologising for the late running on arrival into Bendigo. Except we were actually right on time! In the year 2000 I think that you may find that West Coast could do Spencer Street to Geelong in 42 mins. 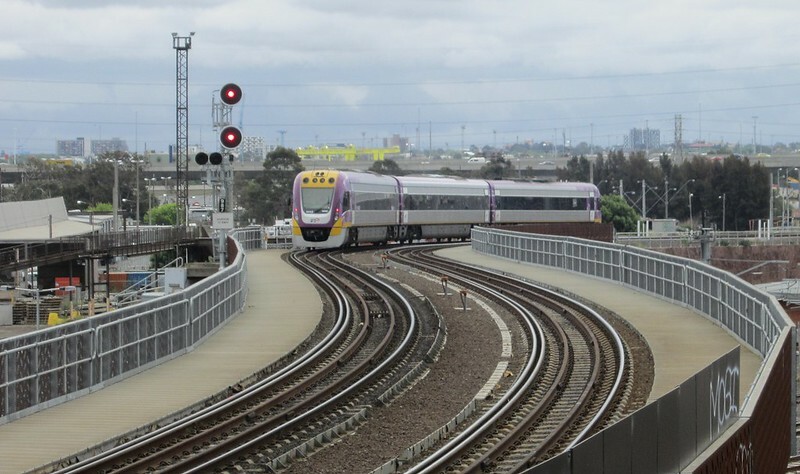 Vline Pass could do it in 47 mins with stops at Nth Melbourne and Nth Geelong. This is Prior to any fast track upgrades. Clearly there is a problem. @Rodney, are you sure about that? The fastest time in this timetable from 2000 is 51 minutes with no stops. My greatest issue with the current timetable is, the Warnambool trains, operating in place of a Waurn Ponds service. Not only do you have a three or four car train, replacing a six car train, that same four car train must also service all those locations west of Waurn Ponds. That is mad for sure. And, it includes suburban stops such as Tarneit and Whyndam Vale too. As a three day a week commuter from Waurn Ponds to Southern Cross, there needs to be duplication of the tracks to Waurn Ponds, because it limits the number of trains per hour along that section, where the majority of folks get off between South Geelong and Waurn Ponds (the only stations on the line with significant parking). Many folks have given up with the terrible service, and now drive to Lara, which has more than tripled its parking capacity, and it’s very full by 8 am every day. If I drive in to Melbourne, the costs are about the same when taking into account a daily Myki fare (three days a week makes a 7 day pass uneconomic). The drive takes around 30 minutes less in peak hour, and nearly an hour less in off peak conditions. V/Line can’t fix the woes commuting to and from Geelong whilst we stop at Tarneit and Wyndham Vale. Those two suburban stations should be electrified and independent services and a third track made available for them from Sunshine to Wyndham Vale. I feel sorry for those commuters as the trains are always packed, and then another full train load of passengers try to get on, so the crush load is ridiculous in the morning, and again on every service that stops there in the afternoon. Lastly, and I can’t say this enough – it takes 45 minutes on the 7 am to not quite 7 pm useless bus that circulates slowly from Deakin to Waurn Ponds Station. You can actually walk in about the same time. There is zero chance that we can make an end to end PT journey possible without fixing the feeder bus services. Considering how empty these useless services are (because you really have to commit to a 2.5 hour journey if you HAVE to use the feeder buses), they should replace the 44 seat buses with small commuter buses and put more on the road from the first train service to the last service doing fairly direct routing. It’s only a 5 minute drive if they did it right. This line is the victim of its own success, and the sooner V/Line management get to a metro style train every 10 minutes all day to Waurn Ponds, the better. There’s a great deal of actual infrastructure missing to do this, but some of it is fixable like the useless feeder bus situation, which seems to be in place to enrich the local bus company rather than service the community. Interesting that the 5:55pm train (the fastest service) is operated by Sprinters, which travel at 140KM/H, 30KM/H slower than the newer Vlocities. This just shows that skipping stations can save time. Sorry, the Sprinters travel at 130KM/H, just a typo. V/Line is an extension of the government of the day, their management is just a shield for the Transport Minister of either party to blame somebody else for problems they won’t/can’t fix. Obviously the operator would love duplication after Geelong but they can’t just do it off their own bat. The RNDP had a few things in it but a lot of it was toilet paper – let’s have a medium term plan of how things can improve, including ripping up timetables and allowing experts to put it together from scratch instead of a mixture of the company cheating with unrealistic travel times and the government forcing services on them that they can’t run for political gain.